ISIS seem to be obsessed with gold, having stolen hundreds of millions worth of gold bullion so far. It’s obsession may be for very good reason, as they claim that the world’s economy is about to crash, along with the paper money system it currently relies upon. In an ISIS video named “Dark Rise of Banknotes and The Return of the Gold Dinar,” they say that banknotes are now “worthless pieces of paper” and assert that the rise of banknotes stem from “satanic concepts of banks, which mutated into a fraudulent financial system of enslavement orchestrated by the Federal Reserve in America“. ISIS leaders have been identified by law enforcement and sanctioned by the U.S. Treasury, so they’re essentially blocked from using the world’s legal financial system. But gold offers a way for them to buy weapons and equipment, because metal isn’t tracked like paper cash and electronic wire transfers. “It’s accepted all over the world. No one’s going to argue with you or question how you’re going to pay for something if you offer gold,” said Daniel Karson, the chairman of private investigative firm Kroll. Karson, who previously investigated financial fraud cases in New York and hunted down Saddam Hussein’s hidden assets, said banks typically lower their identification standards for customers if they offer gold. 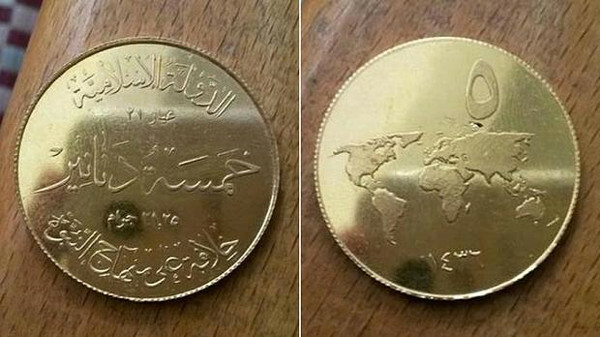 Then again, ISIS claims it is minting its own gold coins with recognizable logos, so that would get tracked anyway. Gold does have drawbacks. It’s extremely heavy. Consider what it takes to carry $1 million. A duffel bag stuffed with $100 bills weighs 22 pounds. It would weigh 58 pounds with gold. “They’re better off using the existing Iraqi and Syrian currency they have,” said Martin Reardon, a former FBI agent who specialized in counter-terrorism missions. He’s now an executive at The Soufan Group, a private intelligence firm. In short: Gold is just not very convenient for quickly making a lot of transactions. The ISIS fixation with gold is also a recruiting tool. It offers a departure from corrupted, modern Western ways, according to Andreas Krieg, a military scholar who teaches at King’s College London in Qatar. For example, ISIS blasts the “petrodollar” system that made dollars the global reserve currency. There’s been constant demand for American bills ever since the Nixon administration struck deals with Saudi Arabia and other OPEC nations so that all oil exports are priced in U.S. dollars. Krieg explained why this resonates. The hypocrisy here is that ISIS is accepting U.S. dollars to sell oil and using them to buy equipment, Krieg said.